California buckwheat has shown excellent performance as a conservation plant on critical areas and problem soils, such as Serpentine, decomposed granites, and high pH soils. Its showy white flowers also make it ideal for environmental enhancement uses. Due to its long flowering period, California buckwheat is also an excellent insectory plant that provides nectar sources for beneficial insects when planted next to crops as part of an (IPM) Integrated Pest Management program. Ethnobotanic Uses: The Cahuilla drank leaf tea for headache and stomach pain. Hot root tea drunk for colds and laryngitis. Root poultice was applied to wounds. A tea of dried flowers or dried roots was taken to prevent heart problems. 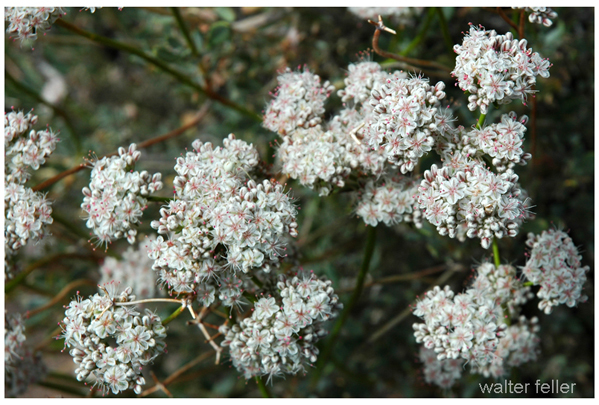 Studies have identified leucoanthocyanidins beneficial to the heart in other Eriogonum species. General: California buckwheat is a native evergreen shrub about 12 to 39 inches high and 28 to 51 inches wide. Branches are numerous, slender and flexible. Leaves are egg-shaped, 1.5 to 3.8 inches long and less than half an inch wide, smooth or fuzzy above and fuzzy beneath. Flowers are white or pink. Flowering period is from May through October. Seeds are light brown, angled and very small. California buckwheat grows naturally on dry slopes and canyons from San Diego County north to Marin County. It is also found in Utah, Arizona and northwestern Mexico. Dry slopes, washes and canyons in scrub.